Things that pull or push other things, in today’s post. So, that NYC Ferry trip I mentioned in yesterday’s April Fools post? As it happened, a humble narrator hit a fortuitous moment in terms of river traffic when boarding that particular boat. Everywhere I pointed the lens, there seemed to be something going on. For the curious – this was the Soundview route, which I boarded at East 34th street over in the City, after taking the Astoria line from Hallets Cove to that location. A few people have asked me (in real life or “meat space”) if I have some sort of relationship with the NYC Ferry people since I keep on mentioning them. The answer is “sort of,” since I do know a couple of people who work at Hornblower through the old NY Harbor crowd. 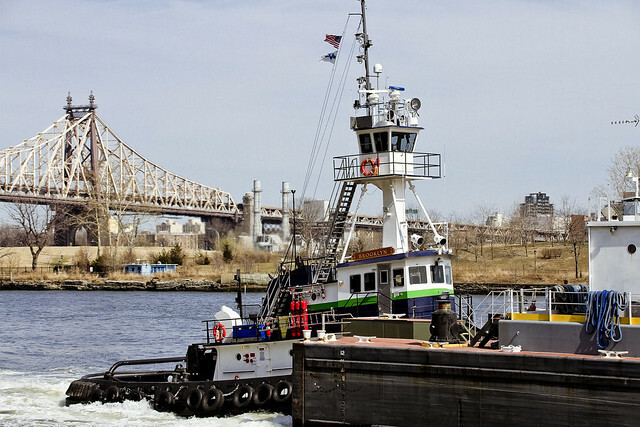 A while back I did a blog post for NYC Ferry about what to do and see nearby their Astoria dock, an effort which I was recompensed for with a free 30 day pass on their boats. That’s pretty much the size of it, except for the taxes we all pay to the City which heavily underwrite the $2.75 fare. I’m just a fare paying passenger, and one who really enjoys getting out on the water – even if it was a particularly cold and blustery March afternoon. Spotted this rather smallish tug at Hells Gate, towing a couple of barges of what looked like either gravel or uncooked asphalt. That’s the Wards/Randalls island combine in the background, the shoreline of which hosts a staggering amount of municipal infrastructure. 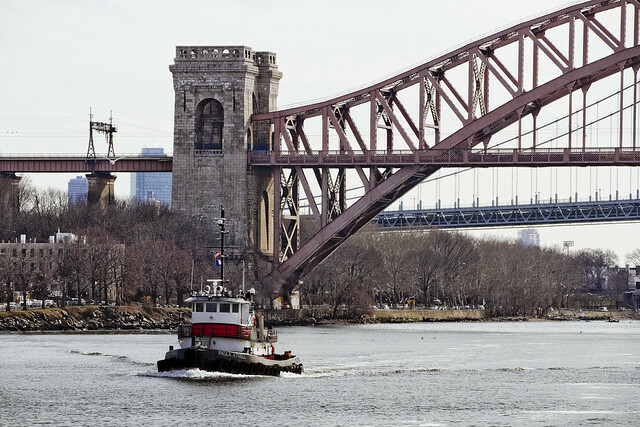 The NYC DEP has a combination of wastewater and sludge dewatering facilities on the shoreline mirroring Astoria Park, there’s the Hell Gate railroad Bridge and the East River span of the Triborough Bridge complex as well. Just yesterday, I was making plans with a couple of people to spend a day on the Island(s) and get to know the place a bit better. Used to be two islands, Randalls and Wards, but… y’know… Robert Moses. Coming from the south/west, another tug was spotted transversing Hells Gate. 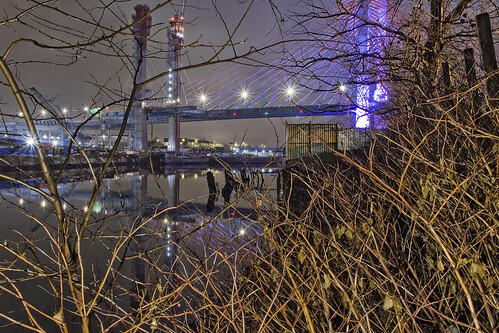 That’s the Astoria Park shoreline, and you can just make out the nascent skyline of LIC’s Court Square neighborhood peeking out over the bare trees behind the bridge. I’ve been told that even with modern vessels, you have to “pick your battles” with the swift currents in this section of the river lest you end up burning up half your fuel supply fighting its ebb and flow. One time I was sitting in Astoria Park, right alongside the Hell Gate masonry seen above, and taking pics. I started laughing while watching some rich guy in a speedboat gunning his engines against the current, but his boat was just barely holding position agains the incoming flood tide. 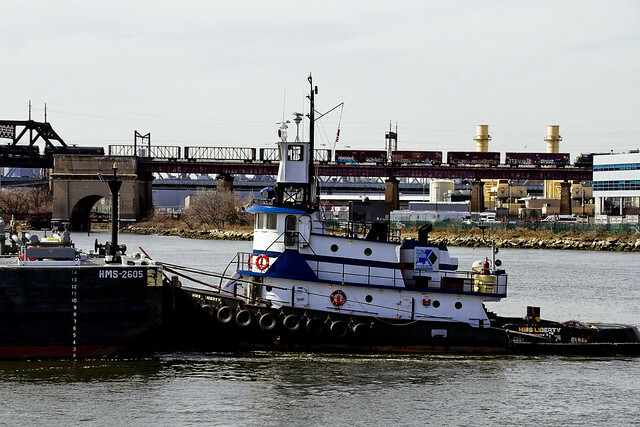 This isn’t necessarily the case with tugs and other overpowered boats, of course, but fuel costs are what rule the roost in the shipping and towing business. How much you “spend to earn” is where an experienced versus inexperienced crew and scheduler make all the difference. Same thing is true with shipping by rail and trucks. 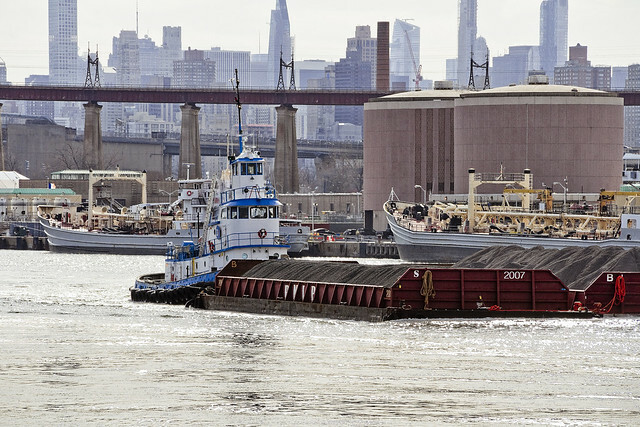 Another fuel barge and tug combination was passed, while the camera’s point of view was looking north westwards over Randalls/Wards Island towards the Little Hell Gate Bridge and the roads leading to Triborough’s toll plazas. 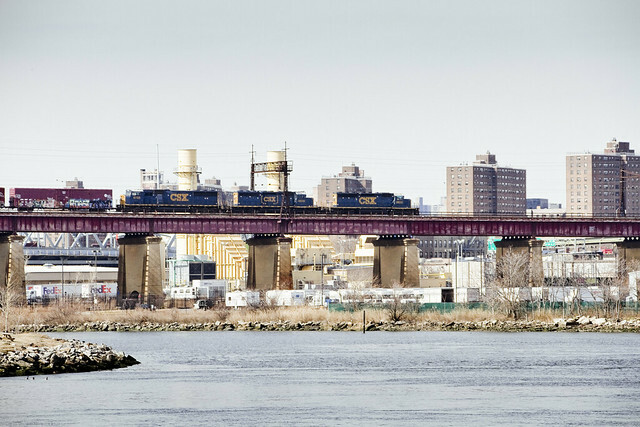 Good timing, thought I, as a CSX train set was transiting over the elevated rail tracks connecting to Hell Gate’s East River Arch Bridge (which connect to the NY Connecting Rail Road tracks in Queens) and heading for the Bronx. 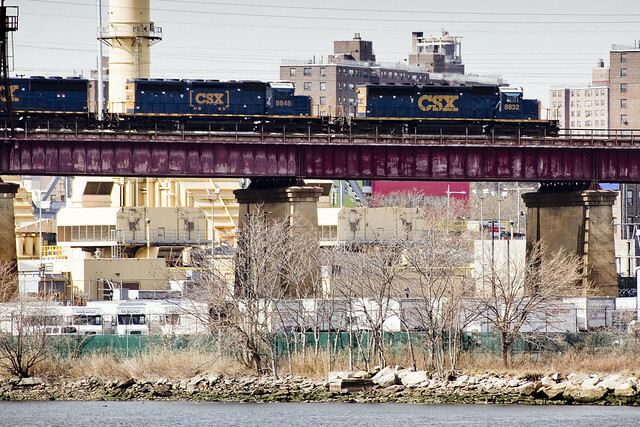 I think the next stop for the CSX rig will be Owls Head yard in the Bronx, but that’s just a guess. Luckily, I had outfitted the camera with zoom lens for the trip. It’s a Sigma, the 18-300 f3.5, which provides the “all in one” functionality needed for this sort of excursion. One thing about the East River and its various tributaries and estuarial bays is that you are going to want to shoot both wide and long, sometimes flipping back and forth several times in just five minutes. Given that you’re on a boat, speedily moving through the water and with all kinds of weird particulates circulating in the air column… you want to limit the number of lens flops you do. I can recommend the Sigma, btw. I also have and love their 18-35 f1.8. What was that I was just saying about zooming in?